DCC++ is an Open Source Arduino-based Do-it-Yourself DCC Command Station. You can learn more about DCC++ on the DCC++ Website. Note: DCC++ is a separate project from JMRI. If you have questions about building a DCC++ system, operating it, etc, you should get help via the DCC++ Website and the DCC++ Trainboard discussion. The JMRI discussion groups can only provide limited support for DCC++ itself. Currently DCC++ Base Stations can be built from either the Arduino Uno or Arduino Mega platforms. JMRI should support either platform via USB or Network connection. Simulator: Simulated Base Station for off-line operation and testing. Network: TCP/IP connection from JMRI to a Base Station with an Ethernet or WiFi Shield. To use the Simulator, simply choose that option in the JMRI Preferences. Note that some features do not work in the Simulator. 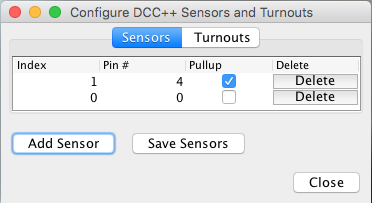 For example, the Simulator does not (yet) support assigning, storing, and remembering Sensor and Turnout assignments. The Simulator interface is functional enough to keep JMRI "happy" while working on offline projects such as Operations or Panel and Logix design, but is not intended to be a full-fledged Base Station Emulator. For the DCC++ Over TCP, a host computer must be connected to the Base Station over a Serial or Network connection (or a simulator). This host computer then runs the DCC++ Over TCP Server. A remote computer (or several remote computers) can then use the DCC++ Over TCP (Server) interface to remotely access and control the Base Station. JMRI currently supports the V1.1 Base Station Interface. Some V1.0 commands may not work. In order to use an Arduino as a Base Station, you must first assemble the device and download the Base Station firmware to it. Please follow the instructional videos linked below under Other Info. To connect your computer to a DCC++ Base Station, first install the appropriate drivers. For the DCC++ Base Station with JMRI, you may need to install a device driver on your computer. Please refer to the Arduino Getting Started pages for instructions. Note: If you have already installed the Arduino IDE software, the device drivers should already be installed. When the device drivers are installed, connect the Arduino Base Station to your computer using a standard USB cable. Once the drivers are installed, you are ready to configure JMRI. Start one of the JMRI-based programs, Then go to the preferences panel. This opens automatically the first time a program is run, or you can select it from the "Edit" menu. Select "DCC++" from the top selection box ("System Manufacturer"). Restart the program. You should be up and running. First, connect the DCC++ Base Station to wired or WiFi network and record the IP Address and Port number. You may need to connect the Arduino to a host computer temporarily and use the Arduino Serial Monitor to get this information. Now you are ready to configure JMRI. Start one of the JMRI-based programs, then go to the Preferences panel. This opens automatically the first time a JMRI program is run, or you can select it from the "Edit" menu (from the Application menu on OS X). Select "DCC++ Ethernet" from the second selection box ("System Connection"). Input the IP Address and Port Number of the DCC++ Base Station. First, connect the DCC++ Base Station to the host computer via the Serial or Network interface as described above. On the host computer select "Load DCC++ Over TCP Server" from the DCC++ Menu. Check the settings, then press the "Start Server" button. If you want the server to automatically start when JMRI is launched, click the checkbox provided. The Host computer must be running with the DCC++ Server active before launching the Client computer. On the client computer, launch JMRI on the Client computer. In the Connection Preferences, select DCC++ as the System Manufacturer. Select "DCC++ Server" as the System Connection Type. Enter the network name or IP address of the host computer and verify that the port number is the same as on the host computer. Save your Preferences and restart. Once both the Host and Client instances of JMRI are configured, you can use the Client JMRI just the same as if it were directly connected to the Base Station. The client JMRI instance can be on the same computer, in the same house, or across the country from the host. Start one of the JMRI-based programs, Then go to the preferences panel. This opens automatically the first time a program is run, or you can select it from the "Edit" menu. Select "DCC++ Simulator" from the top selection box. There are no additional configuration steps required to use the DCC++ Simulator.